Green-thumb soul, DIG his method. 1Michel and Geneneviève Fabre, during the academic year 1968-1969, when I had an invitational Fulbright professorship at the University of Grenoble, became my first friends in France — despite the distance between Grenoble and Paris, their home. 2Their friendship, besides reminding me of the irrelevance of place, helped me to rationalize my nightmarish residence (autobiographically pictured) in the mountain chalet of Seyssins, owned by Madame Disdier of nearby Grenoble. As the years passed, and as Michel’s reputation as a principal authority on African American culture confirmed its international proportions, I began to see his career in its relationship to my life as a Black writer in movement between two civilizations, North American and European. 3As I tried to suggest in the four-haiku tribute composed to accompany this note, Michel has, more than any scholar in France and probably in Europe, tended the once-neglected garden of African American literature; and he has hoed his rows and nursed their flowers with rare and skillful devotion. 4In a literary garden of the magnitude of Michel’s, there are always small areas curiously deprived of sun and rain — as if some undiscovered or uncodified law of nature, made seemingly constant by its own repeated imbalances, operates to deflect nourishing attention. Michel apparently sensed that my work was developing near the partial shadows imposed by such a wayward law; and he took pains to illumine parts of my life and publications by writing reviews, essays, and book chapters that I am pleased to remember. 5If my lifework becomes more widely scrutinized — fulfilling predictions that I have read and heard — whatever flowering it achieves will owe much to Michel and to his sensitive comprehension. EMANUEL, James A. 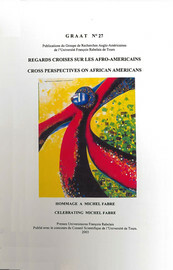 A good force in my life and work In : Regards croisés sur les Afro-Américains : Mélange en l'honneur de Michel Fabre [en ligne]. Tours : Presses universitaires François-Rabelais, 2003 (généré le 22 avril 2019). Disponible sur Internet : <http://books.openedition.org/pufr/4165>. ISBN : 9782869064690. DOI : 10.4000/books.pufr.4165. Emanuel, James A. “A good force in my life and work”. Julien, Claude. Regards croisés sur les Afro-Américains : Mélange en l'honneur de Michel Fabre. Tours : Presses universitaires François-Rabelais, 2003. (pp. 107-108) Web. <http://books.openedition.org/pufr/4165>.